Buy a child fishing rod for your son or daughter and introduce them to a lifetime hobby that is both rewarding and relaxing. That first fishing rod can be a cane pole, or a push button spin casting rod and reel. These are both easy to learn to fish with. As an adult if you are looking for your first fishing rod consider a push button bait casting rod and spin casting reel. Simplest to use, a cane fishing pole is a good first child fishing rod and can be used from the bank of most ponds and lakes. Most commonly caught will be blue gill and sun fish. 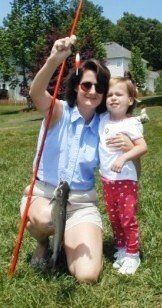 Watch as your child's eyes grow big each time the bobber goes under and they pull out a fish. Tie a string roughly the length of the cane pole to the end of the pole , add a hook, weight and bobber, bait your hook and you are ready to fish. Adjust the bobber distance from the hook so that the bobber stands up. Wait for the bobber to start showing when a fish bites the bait. Raise the tip of the cane pole up and pull your fish out of the water! These are short, colorful and fun fishing rods. They also offer an inexpensive version of a spin casting reel, which is easiest for children to learn to use. They are excellent as a first rod and reel combo to take to the front or back yard and let them practice casting using a soft rubber practice lure. Yes, you can catch fish with them too, but the line is often light weight and the length of the rod does not give you much leverage to bring the fish in. But to get started - what a great way to build enthusiasm. Blue gill, crappie, and even bass from farm ponds have all been caught using these rod/reel combos. When your child is ready for more adventure, purchase a spin casting reel and rod combination. Depending on their age and size these make a good first child fishing rod. 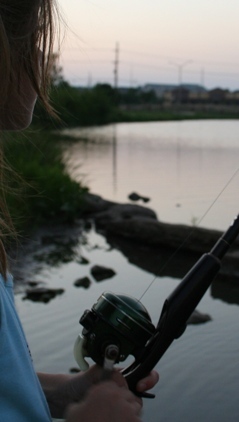 This young girl is using a Johnson Century rod and reel that is over 30 years old. Below is a picture of a newer model of that reel. You can find several manufacturers who offer these types of reels in a combination with a 5-6 foot bait casting rod made of fiber glass or a composite blend of graphite. Shakespeare, Ugly Stick, Zebco and Shimano are some of the common names to look for. Yes more expensive reels work very smoothly, and if you are a pro and make thousands of casts a week, then you will want to invest in more expensive models.